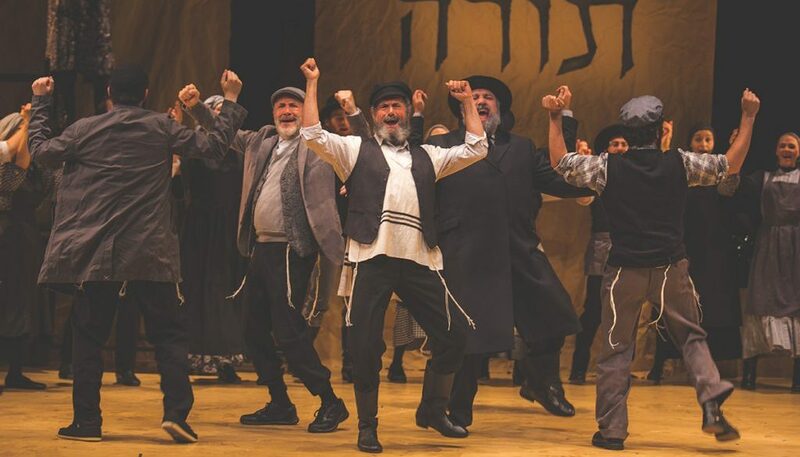 There is a reason that the current National Yiddish Theatre Folksbiene’s production of Fiddler on the Roof (Fidler Afn Dakh) in Yiddish has been held over not once, twice or three times. It has just been announced that it will be extended until November 18. Obviously, this is not just an off-Broadway show cobbled together during the summer for the sake of lovers of the Yiddish idiom, as some might have suggested. Rather, this is a true retelling of the Sholem Aleichem tales, as originally envisioned by Sheldon Harnick, Jerry Bock and Joseph Stein. But, it is the work of the late Shraga Friedman, whose influence looms most largely in this production. Friedman, a journeyman actor and director, was a native of Warsaw. He emigrated to Palestine before the outbreak of World War II and the later declaration of Israeli independence. He was there when the nascent nation moved from playing the role of young upstart into that of a cultural oasis in the Middle East where the arts could flourish like the former desert lands that were now irrigated and cultivated. 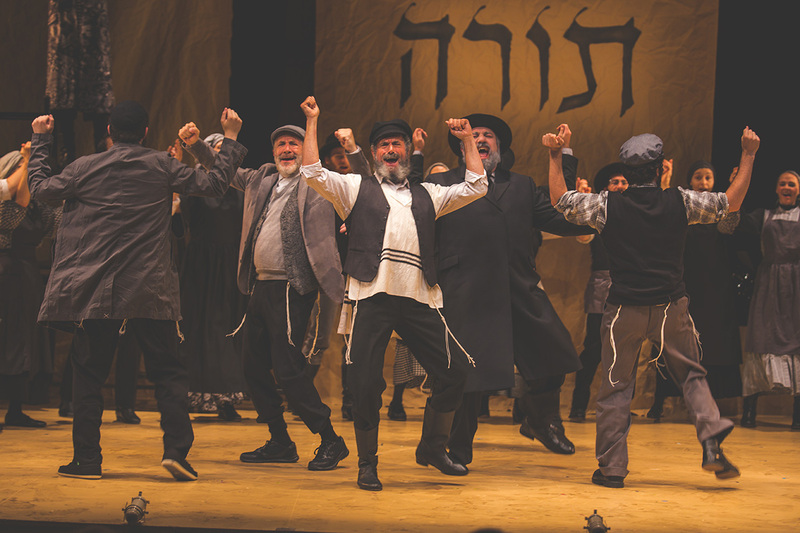 The original cast of Fiddler on the Roof opened in 1964 at the Imperial Theatre and transferred to the Majestic Theatre and, later, the Broadway Theatre until 1972. Friedman was familiar with the Sholem Aleichem stories of Tevye the dairyman, which were Yiddish classics. He was able to obtain a copy of Joseph Stein’s book along with Sheldon Harnick’s lyrics and Jerry Bock’s musical compositions. Rather than translate line by line, Friedman took the essence of the work and put it into the Yiddish idiom. He kept close to Stein’s book, but added colorful Yiddish expressions where they would make the most sense for each of the characters. 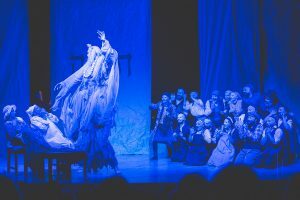 The result is a retelling of the popular musical into the mother tongue, which brings with it an authenticity to the work that is both genuine and revelatory. Friedman mounted his original production of Fiddler on the Roof in Yiddish in Tel Aviv in 1965, but the manuscript was lost to the world for 53 years. 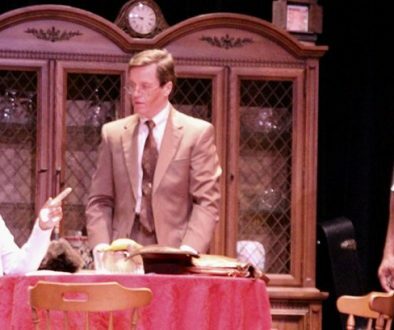 Tony and Oscar Award winner Joel Grey was asked by the National Theatre Yiddish Folksbeine’s CEO Christopher Massimine and artistic director Zalmen Mlotek to revive the work this summer. The music is the same, but the energy felt in the lyrics is somehow enhanced just as the dialog is so expressive that the characters truly come alive as never before seen. Grey was confronted with a Herculean task. Many of the cast members he chose had proven their worth with previous NYTF productions such as the 2015 and 2016 productions of Di Goldene Kale (The Golden Bride) and 2017’s Amerike: The Golden Land, a pastiche of many Yiddish scenes which retold the immigrant experience. Many of the actors had a small lexicon of Yiddish words, but most did not. In a month of rehearsals they would not only be expected to master the language, but be ready to imbue in their performances the essence of what Friedman and the work’s originators had intended. For Grey, it has proven to be a work of joy. The son of famous Klezmer musician and recording artist Mickey Katz, Grey was raised in a home without Yiddish, despite his father’s being quite fluent in it. It turns out the language was too coarse and common for his mother to permit. In a sense this production is a directorial redemption for Joel as he returned to taste the subtleties of a nearly-dead language that once flourished across Europe and America. Working closely with choreographer Staś Kmieć, considered the foremost authority on Polish dance, and NYTF’s music conductor Mlotek, Grey fashioned the work from a lump of unfinished clay into a showpiece that had been cured and fired in the kiln of his genius. Skybell plays well with the lovely Jennifer Babiak, who is his Golde, a simple housewife raising children and keeping a house over their heads. 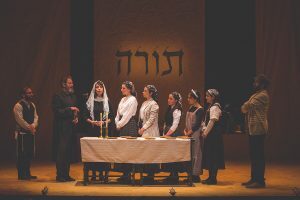 Their relationship is best told in Act Two’s “Libst Mikh Sertse?” (“Do You Love Me?”), but it is also seen in Act One’s fervent “Shabes Brokhe” (“Sabbath Prayer”) and the ever-beloved “Tog-Ayn, Tog-Oys” (“Sunrise, Sunset”). While “Traditsye” has all the players on stage at the very beginning of the work, we are first truly introduced to Tevye and Golde’s daughters in “Shadkhnte, Shadkhnte” (“Matchmaker, Matchmaker”). Here we meet Tsatyl played by Rachel Zatcoff, Hodl played by Stephanie Lynne Mason and Khave played by dance captain Rosie Jo Neddy. These are the three main daughters who are cleverly woven into Tevye’s coming to terms with modern life in a Russian shtetl. Tsatly is the first to choose her husband, despite her father’s right to arrange the marriage. 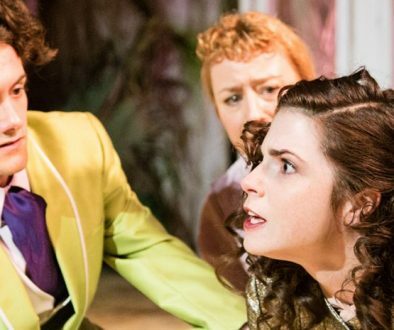 He loses out on a dowery from Leyzer-Volf, the butcher (Bruce Sabath), when she falls in love with Motl Kamzoyl (Ben Liebert), a common tailor with whom she shared an uncommon past. Zatcoff not only plays a beautiful bride-to-be, but has an exquisite voice to match and a joyful exuberance in playing the role. 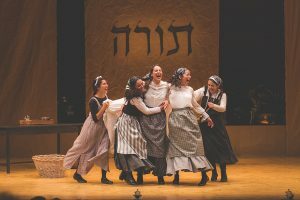 Hodl is swept off her feet by Pertshik (Daniel Kahn), an inconoclastic Jewish revolutionary and free thinker, hired by Tevye to instruct his daughters, especially the two youngest Shprintze (Raquel Nobile) and Baylke (Samantha Hahn). Hodl takes the bold step forward of not only informing her father of her acceptance of Pertshik’s engagement, but asks for his blessing. Here they represent less formal ties to the past and more of an attachment to the changes that will come with the new century. Khave represents the biggest challenge to Tevye’s foundation of faith. When she opts to fall in love with an outsider, Fyedke (Cameron Johnson), he takes her away from the safety and shelter of Judaism and into a harsh world without those traditions Tevye held so dearly at the beginning of the work. This is the most trying of the challenges to his authority as father and husband and the most difficult for him and others to overcome. Johnson, who proved himself in NYTF’s Di Goldene Kale amazes with a rich lyric tenor that shines in “Lekhayim” (“To Life, Lehkayim”) and his acrobatic dance moves make him a standout on the stage. Neddy’s “Vayt Fun Mayn Liber Heym” (“Far From the Home I Love”) is a plaintive cry that shows her attachment to her past and her family, but also her determination to be with her beloved and the uncertain future he represents in Siberia. Veteran TV, film and stage actress Jackie Hoffman, plays a charming Yente, the matchmaker, whose comic timing is down to a tee. Her performance in “Der Klang” (“The Rumor”) shows she is at the top of her game. Of special note is Lauren Jeanne Thomas as Der Fiddler, who shows up at every major decision Tevye must make as a reminder of his past and of his connectivity to his religious upbringing and culture. Thomas prances about the stage with her fiddle and bow in hand reminding Tevye of how precarious life can be and how important his decisions will be. 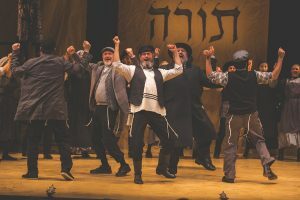 The entire cast excels in the hilarious “Der Kholem” (“The Dream”) in which Tevye petitions Golde to interpret a dream with consequences for Tsatyl’s betrothal to Leyzer-Volf and the tearful “Anatevke” (“Anatevka”) as the finale of Act Two in which the villagers depart for destinations unknown. 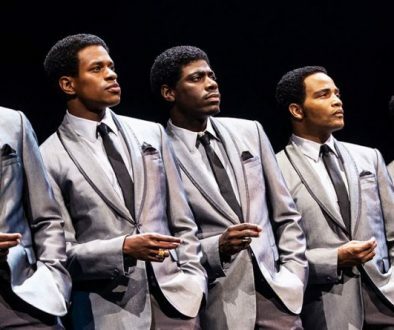 While the stage of the Museum of Jewish Heritage is smaller than those found on Broadway, there is no doubt that this is a large work whose import is hard to contain. The Yiddish culture that abounded and blossomed at the turn of the 20th century can never return, but this work has galvanized the language in a way few, both inside and outside of the Jewish world, could ever suspect. This is a Fiddler on the Roof that speaks volumes through the judicious employment of a few select words and masterful direction. The players bring about absolute joy at each show, while the orchestra plays beautifully under Mlotek’s baton. 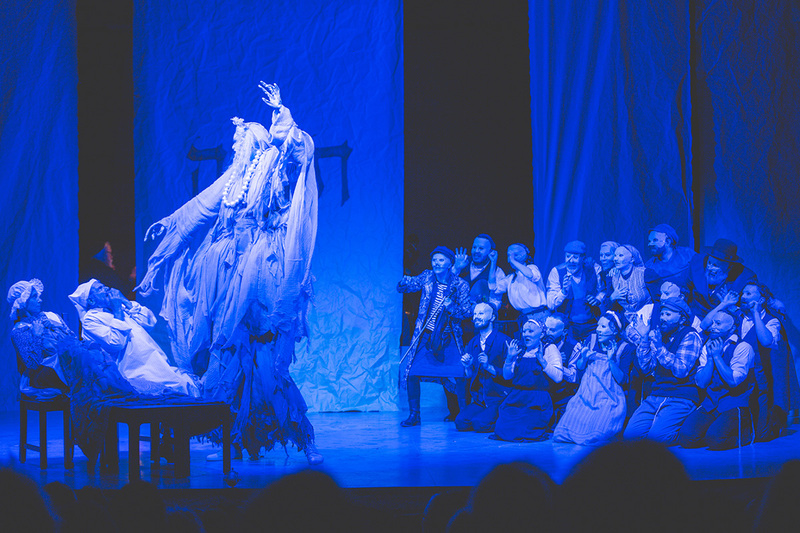 Costume designs by Ann Hould-Ward are noteworthy and the lighting design by Peter Kaczorowski is also well executed. Supertitles in English and Russian help those brush up on their Yiddish. 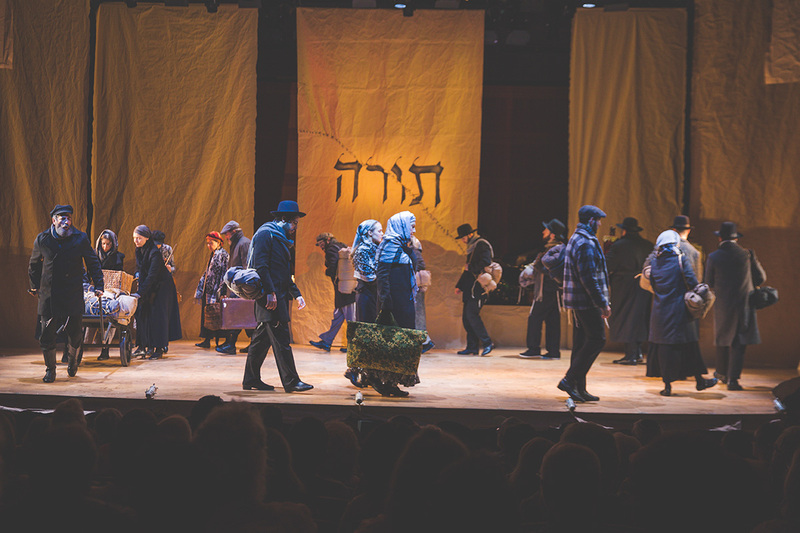 Fiddler on the Roof in Yiddish (Fidler Afn Dakh) continues at the Museum of Jewish Heritage, 36 Battery Place, from now through November 18. Show time vary, so check the website or call 212-213-2120.